A Co-Ordinate Measuring Machine (CMM) is used for measuring objects down to the most precise measurement. We have three different CMM Machines here at MNB Precision along with skilled and qualified Engineers who guide them. Even with all the features and precision that these CMMs are capable of we have skilled and qualified Engineers on hand to oversee and operate these machines. That is why we have invested in putting a world-class team of Engineers together that know how to get the best out of each and every one of these CMMs. Our team of Engineers is well versed in not only using the machines but also maintaining them to ensure that they are able to give accurate readings and results every time. While they are built to perform, it is actually the work of our in-house team to make sure that they are always ready to perform and are in the right condition to perform. Our experts are also well trained on how to use the equipment for the best results. While having these CMMs is a great asset to your engineering goals our greatest asset is the team that is able to not only use these machines to help you bring your ideas to life but also maintain them and work hand in hand to keep them operational. Needless to mention, these are highly sensitive machines that work with fractions of units and require a lot of care to ensure that those parameters are not thrown off. As with any case of engineering, even the best CMMs do require the best hands to be able to work optimally. This is why we recognize our workforce and team of engineers as the fourth force behind the machinery that will work tirelessly to deliver unbeatable results. Zeiss Accura – The Zeiss Accura has a wide range of configurations meaning it can be used for almost any job. It has multi-sensor capabilities with its performance and precision being second to none, which is why we use it for CMM Inspections. Within the UK the only companies MNB Precision know of that has the accuracy and capability of this machine are Schlumberger and Rolls Royce. 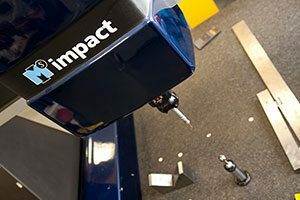 IMS Impact – The British built Impact machine is extremely accurate. It offers some of the fastest performance in the market with 3D acceleration rates of 2500mm/sec2 to reach 860mm/sec traverse speeds. Mitutoyo Euro 9166 – The Mitutoyo Euro uses a temperature compensation system which guarantees an extremely high level of accuracy. Timely & Flexible – Our team of professional Engineers work in a timely manner ensuring all deadlines are met for both small prototypes and large-scale projects. We are flexible and will cater to our client’s bespoke needs. Technology Driven – We are always keeping up to date with the latest technology advancements, this allows us to create only the very best and up to date products. Highly Reputable – We have 30 years’ experience working with a large range of clients including Mercedes Benz, Honda, Alstom Power Ltd and more. High-Quality – Here at MNB, quality is assured with every product manufactured. Each product goes through vital testing before being handed to the client. 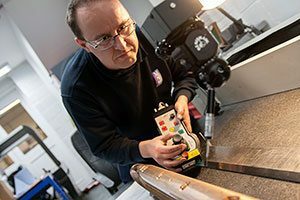 Capabilities – We not only provide CMM Inspections but also provide a wide variety of Precision Engineering Services. For more information on CMM Inspections, CAD-CAM Software or any of our other services, get in touch with us today on 02476 695 959. Fancy working for us? Check out our careers page.